Master Moves Mickey is a new, interactive Mickey Mouse toy from Fisher Price and Disney that talks, dances and plays music. Master Moves Mickey has over 15 unique moves, including a The Handstand and The Spin Cycle, that are performed with original songs. All you have to do is squeeze his nose and the dance party begins. Many of the moves are simple for children to mimic and the songs are quite catchy. 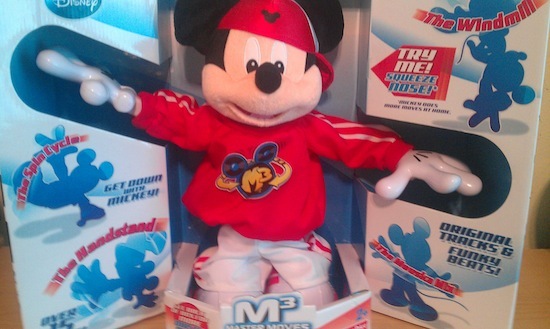 When I first saw the Master Moves Mickey toy (AKA M3) I was a bit apprehensive; a breakdancing Mickey seemed so odd. However when my 2- and 3-year-old sons saw it, they were immediately enthralled. At first we had some trouble getting him to work properly. Mickey had a tough time performing some of his moves on our carpet and even on our tile floor he would catch his foot or hand between the tiles and fall down. When I set him up on the kitchen table, it was tough for my two young boys reach him, and he had more limited space. I finally set him up on a small children’s table and dealt with him falling off every now and then when he ran out of room. Personally I was not the biggest fan of Master Moves Mickey. I found him to be a bit annoying; he was too much of a departure from the classic Mickey character that I love so much. My kids on the other hand, adored it! They spent hours dancing around and singing and trying to copy all of Mickey’s moves. They loved dancing with Mickey so much that I found it impossible to dislike the toy. Young children will find this toy delightful and get many hours of fun out of it, especially those who love dancing and love Mickey Mouse. Older kids might not enjoy it as much because it can get repetitive and the movements and language seem to be geared more towards the pre-school age group. If you have young kids, Master Moves Mickey would be an excellent gift this holiday season.